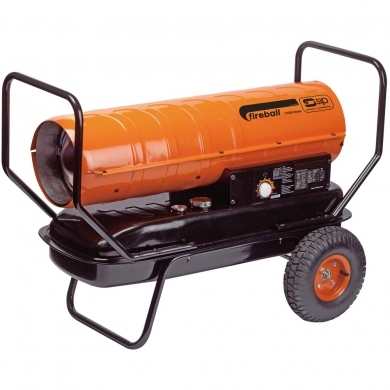 Powerful hard wearing heater from SIP has the ability to run from diesel, paraffin or kerosene. The large 40 litre fuel tank capacity means you can run the heater for longer without the need to refuel as often. Using an average fuel consumption of 4 litre/hr the run time of this heater lasts for many hours. Offering a huge 125,000 BTU / 36.6kW heat output which is designed to heat an area of up to 900m³ (31,783 cu.ft) with ease. Built on 2 pneumatic wheels which are ideal for any terrain making this heater ideal for heating workshops, farm buildings and garages. Requires a 230v (13amp) electric supply. Featuring a built in thermostat with digital read out which gives optimum temperature control.